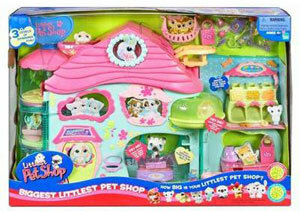 Description Of Item: Welcome to the BIGGEST LITTLEST PET SHOP ? a fun-filled place where pets live and shop together! After a day of shopping for treats and toys, they can go upstairs and relax in their comfy quarters, or play games in the spinning tower. There?s always something fun to do? and lots of friends to play with!